As one of many subsidiaries of Vocus Communications, iPrimus is part of Australia’s third biggest home internet provider (others include Dodo and Commander). As for iPrimus, its product range consists of traditional ADSL2+ as well as several NBN plans with different speed tiers available. A number of SIM only mobile broadband plans are also available, with iPrimus running off the Telstra wholesale internet network. We’ve checked out iPrimus’s product range to determine exactly what its plans include – and how they stack up against similar providers. iPrimus has recently downsized its NBN plans, eliminating NBN 12 plans from its lineup. Customers can choose from unlimited data or unlimited data plus entertainment through Fetch TV. From there you can choose from three contract lengths – month-to-month, 12 months or 24 months. Month to month plans attract a $100 modem fee; 12 month plans attract a $60 modem fee, and 24 month plans cost $0 in setup/modem fees. Entertainment plans attract a $55 Fetch setup fee. iPrimus has a simple set of ADSL2+ internet plans, with the choice of 100GB or unlimited data. You can expect prices to start from around $60 per month and work their way up to $90 a month. While there are only two data points to pick from, prices differentiate by call inclusions. ADSL2+ plans with iPrimus include line rental, and you won’t have any lengthy contracts to contend with if you don’t want. Line rental can cost around $30 a month extra with other providers so this is a noteworthy inclusion. iPrimus is just one of many providers to hop on the Fetch TV bandwagon. Stablemate Dodo also has a few plans with Fetch TV. As for what Fetch actually is, it’s the latest in streaming entertainment, with the device acting as a PVR and set top box, while also being able to stream over 40+ Pay TV channels, along with catch-up services like ABC iView and streaming services like Stan and Netflix. Fetch TV with iPrimus can be had for about $80 a month, which includes line rental, local and national calls, and unlimited data. One Fetch channel pack is included in this price (ordinarily worth an extra $6 a month). These plans carry a $55 ‘activation’ fee regardless of what type of contract you’re on. Pairing this Fetch device with a designated broadband plan means that data used to stream through Fetch does not count towards your overall allowance, which can be handy for data-capped plans. iPrimus’ NBN coverage is subject to that of the rollout of NBN Co – the wholesale arm behind the National Broadband Network. 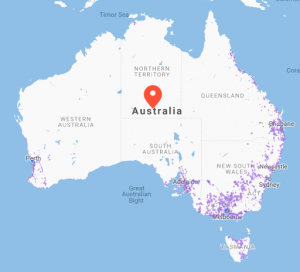 As such, completion is due around 2021 and the fixed-line service will be set to cover around 93% of the population, with the remaining 7% put on either a fixed wireless or satellite service. NBN coverage already spans most capital cities as well as major regional hubs. As you can see from the map, a lot of the eastern seaboard is covered, with major hubs along the Hume corridor from Sydney to Melbourne covered. iPrimus has a surprising amount of bonuses and features to make sure that broadband plan isn’t just a broadband plan. Call Packs: Unlimited local and national calls are included on many plans. Entertainment: There is a designated ‘entertainment’ plan from $80 a month with Fetch TV. Bonuses: Supercharged plans get either extra international minutes or calls to mobiles included, as well as one month free (applied from the third bill). Modems are also included on 24 month plans at no extra cost. iPrimus is more than just broadband – it could end up supplying your home phone and entertainment needs. iPrimus offers unlimited data from $80 a month, but for that you’ll get Standard Plus Evening Speeds (NBN 50). From there you can choose your contract length, your bonuses and more. If you want more than just broadband, iPrimus has partnered with Fetch TV. In this pack you’ll get the Fetch Mighty box, which allows you to record, rewind and pause live TV. You’ll also get access to one Premium channel pack. So choose from documentaries, sports, entertainment, kids and more (ordinarily worth $6 a month). iPrimus customer service is open from 9am to 8pm AEST Monday to Friday. Technically support is open from 8am to 11pm, while sales enquiries are open from 8am to 10pm, and 9-9 on the weekend. Customer service and technical support can also be accessed via email or a live chat function. How does iPrimus compare to other providers? All offer some form of entertainment – be it through Fetch or Foxtel – and offer Standard Plus plans with unlimited data. All in all, it pays to shop around. iPrimus has a small range of internet plans across both the NBN and ADSL connection types. However, across these platforms, it struggles to compete with smaller providers who tend to offer more data for less per month, with smaller or no upfront fees on a no-contract basis. Smaller and larger providers alike can offer unlimited data from as little as $40 a month with line rental included, which iPrimus cannot match. Its biggest plans are over $90 a month, with similar providers commonly offering equivalent plans for less. This is not to say that iPrimus is bad value by any stretch – its internet plans are simple and compete well against an increasing number of new providers. If you’re an existing iPrimus customer, you can rest assured you’re in safe hands, but it’s always worth comparing different offers from time to time. What do customers think about iPrimus NBN plans? In 2018, Australian customers gave iPrimus 4 out of 5 stars for Overall Customer Satisfaction for NBN plans.